Foxtel has announced another pop-up movies channel featuring twelve Star Trek movies starting with the original 1979 Star Trek: The Motion Picture and ending with Star Trek: Into Darkness. A new movies channel Foxtel Movies More will also be available on channel 400, as home to pop up channel events. · Star Trek: The Motion Picture (1979) – The Federation calls on Admiral James T. Kirk (William Shatner) and the crew of the Starship Enterprise to contain an immense object that’s on a crash course with Earth. After investigating, the crew discovers that the object harbors an artificial intelligence with an ominous primary directive. · Star Trek II: The Wrath Of Khan (1982) – As Kirk and Capt. Spock (Leonard Nimoy) monitor trainees at Starfleet Academy, another vessel from the United Federation of Planets is about to try out the planet-creating Genesis Device in a seemingly deserted portion of space. In the process, two of Kirk’s officers are captured by Khan (Ricardo Montalban), an enemy Kirk thought he’d never see again. Once more, Kirk takes command of the Enterprise helm, to meet Khan’s ship in an intergalactic showdown. 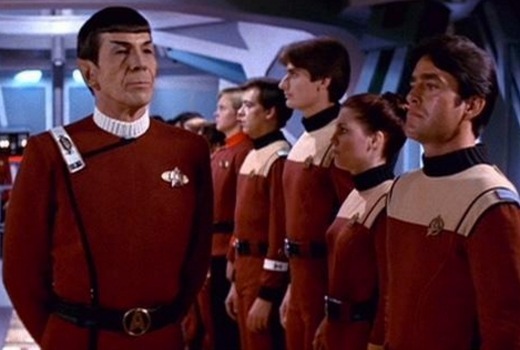 · Star Trek III: The Search for Spock (1984) – Kirk has defeated Khan, but at great cost. Spock has been killed, the USS Enterprise is being scrapped, and Dr. Leonard “Bones” McCoy (DeForest Kelley) has taken ill. McCoy’s odd behaviour is evidence he’s harbouring Spock’s katra (animating spirit), and Kirk takes the Enterprise back to the Genesis Planet to find his friend, only to encounter a party of deadly Klingons. · Star Trek IV: The Voyage Home (1986) – Living in exile on the planet Vulcan, the former crew of the Enterprise takes off in a commandeered Klingon a starship after receiving a planetary distress call from Earth: a space probe has entered into orbit around Earth, disabled global power on the planet and is evaporating the oceans. Kirk, Spock and the rest of the officers travel back in time to retrieve now-extinct humpback whales, which are Earth’s only hope. · Star Trek V: The Final Frontier (1989) – A renegade Vulcan forces Kirk, Spock, McCoy and the Enterprise go to a mysterious planet at the centre of the galaxy in search of the unknown. · Star Trek VI: The Undiscovered Country (1991) – Kirk and the crew of the Enterprise are carrying a Klingon chancellor to Earth to negotiate a peace treaty with the Federation. The ship appears to fire on a Klingon vessel, and the chancellor is killed in the confusion. Kirk and McCoy are arrested for murder, leaving Spock to figure out who really is behind the attack. · Star Trek Generations (1994) – In the 23rd century, the Enterprise is dispatched to the scene of a giant energy field about to engulf two ships. Kirk averts calamity, but is exposed to the field and presumed dead. Years later, the Enterprise’s new commander, Capt. Jean-Luc Picard (Patrick Stewart), learns that one of the disaster’s survivors plans to enter the field by destroying a neighbouring star. Picard now must collaborate with an unlikely ally in order to stop him. · Star Trek: First Contact (1996) – Captain Picard and the crew of the newly commissioned Enterprise battle the insidious Borg to restore the rightful future of Earth. The Borg is trying to stop the invention of the warp drive by going back in time in order to alter the course of human history. · Star Trek: Insurrection (1998) – A Federation mission takes a dangerous turn when a malfunctioning android, Data (Brent Spiner), takes a cultural task force hostage. When Capt. Picard and his crew investigate, they uncover the truth about the Federation mission – a ploy to displace the peaceful inhabitants. Now Picard and his crew must thwart the plot even while experiencing strange side effects from exposure to the planet’s surface. · Star Trek: Nemesis (2002) – Captain Picard leads his crew on a diplomatic mission to initiate peace with the Romulans. But upon arrival on the alien planet, the crew is faced with a threat that could lead to the Earth’s destruction as Picard meets his most dangerous adversary yet. · Star Trek (2009) – In a re-boot of the original Star Trek, a novice crew embarks on the maiden voyage of the Enterprise. Their path takes them on a collision course with a Romulan commander whose mission of vengeance threatens all mankind. If they’re to survive, a rebellious young James T. Kirk (Chris Pine) and a coolly logical Spock (Zachary Quinto) must move beyond their rivalry and locate the Romulan ship before it is too late. · Star Trek: Into Darkness (2013) – The crew of the Enterprise returns home after an act of terrorism destroys most of Starfleet, leaving Earth in a state of crisis. With a personal score to settle, Kirk leads his people on a mission to capture a one-man weapon of mass destruction, propelling all of them into an epic game of life and death (Star Trek: Into Darkness will be added to the Star Trek Pop-Up line-up from Friday 29th July). David, I don’t believe the last ST film, Into Darkness will be shown, it is on the website, but not on the epg, I thought Ch.10 have the rights now for it anyway. Ok. This is the info originally supplied by Foxtel. It’s a pity Foxtel choose to display a large watermark on this channel.